Once you spend some time creating a Brush in Blend, e.g. specifying the different colors in a gradient brush, it’s likely that you’ll want to use the same brush in several different spots in your user interface. 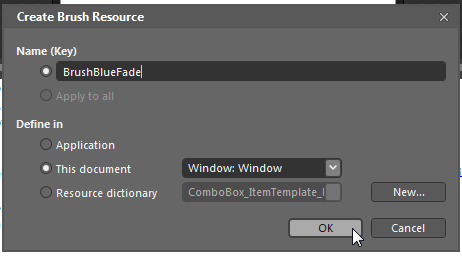 You could just copy/paste the definition of the brush in XAML. But the easier way to reuse a brush is to convert it to a resource and then to reference the resource by name wherever you use it. 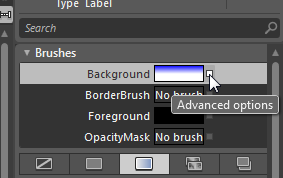 To start with, assume that we have a linear gradient brush defined for a Label control’s Background. Start by clicking on the white square (Advanced Options) to the right of the brush-related property. 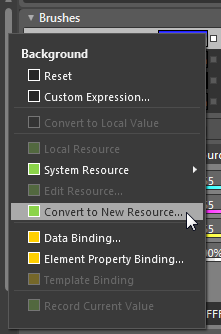 On the menu that comes up, select Convert to New Resource. Specify a name for the new resource. Notice that the XAML now defines the brush as a resource and then references it from the Label.